Look down at the very bottom of the Home screen: If you see a very small symbol of a home, then you have arrived at the official Home screen. If instead you see a horizontal bar, you’re on a secondary Home screen. NOOK Book icon: Tap the icon to be nearly instantly transported to the most recently opened book, magazine, catalog, or other piece of reading material in your NOOK Library. It’ll go to the last page you were reading before you did something else on your tablet. The NOOK Book icon won’t take you to a book you downloaded from Google’s Play Store, or from your local library, or another source. This is for NOOK uses only. Apps icon: Tap the icon made up of 16 very small rectangles to see your apps. You probably won’t be able to see all the apps on one screen. Scroll or flick left or right to see more. As long as you’re just lightly touching the screen, and not pointing with conviction at a particular icon, you can scroll easily. Start any app by tapping its icon here (or tap its shortcut on the Home screen). Either method brings you to the same end: appyness. Menu icon. What you get when you tap the Menu icon depends on what page you’re on. What you see onscreen will probably be in a different order. Doesn’t matter, really. View Type. This one should have been first. If you choose a customizable grid, you can reorder the apps any way you want. Or, you can choose Alphabetical. Edit. 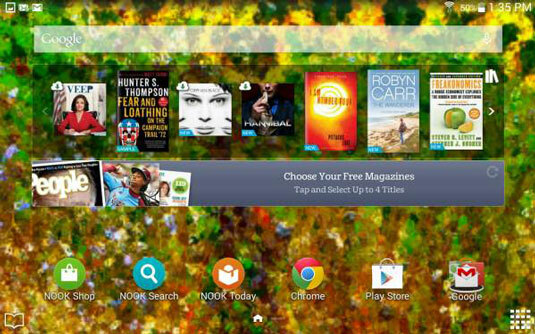 You can create a folder and move some apps into it to neaten up the place; for example, you could put all of the Google apps in one folder and all of the NOOK apps in another. Any organizational scheme that makes sense to you is fine. You can rearrange the order of apps to put the most important ones first or to put all reading apps next to each other — except that you can only rearrange apps if you have previously chosen Customizable Grid from the View Type option. Create Folder. Tap here to make and name a folder. Press and hold icons, and drag them to the folder. You can put reading tools in one folder, web browsers in another. Or you can leave all of your apps scattered about. Whatever works for you. Set Wallpaper. Here’s one way to set the wallpaper background for the Home screen, the Lock screen, or both. Downloaded Items icon. Maybe you want to see only those apps you’ve downloaded (not the ones that were already on the tablet when you got it). Sometimes an icon appears here that was actually brought to your device by Samsung, Google, or NOOK. Don’t know why, and it doesn’t matter. Press the Back key to return to the display of apps. Move your eyes toward the center of the screen. 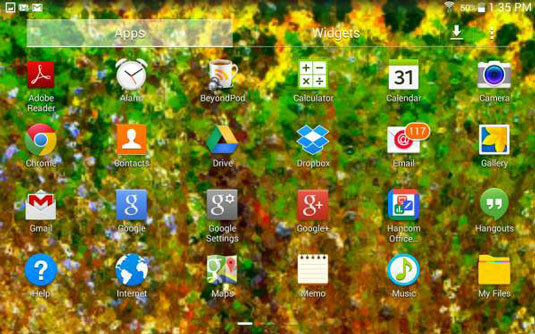 You’ll see a large tab called Widgets, and to the left of that a large tab called Apps. You can switch back and forth between these two by tapping one or the other tab name. A widget is a tiny specialized delivery system for small bits of information. Your Tab 4 NOOK comes with widgets you can install on the Home screen — things like a thumbnail of your calendar, a dual clock display for globetrotters, weather and temperature reports, and the like.